Steering behaviours can be used to position 3D embodied agents in small groups engaged in relatively simple social interactions such as in group conversation or walking while talking. Less is known about scaling these mechanisms for situations with complex dynamics requiring agents to perform actions beyond walking, turning, talking and gesturing. Here, we present a model for controlling three agents in an example of such a situation: a vigorous quarrel. The model combines a general steering behaviour for keeping the three agents in a triangular formation with a probabilistic two-level hierarchical state machine (hFSM) for unfolding the quarrel by means of changing parameters of the steering behaviour and issuing actions to the agents. The model has been implemented using UnrealEngine2Runtime on the example of a boy dating two girls at the same time who do not know about each other. The user can influence the course of the quarrel by changing attitudes among the agents. To create a list of the agents’ actions and the hFSM, we video-taped about 40 episodes in which three actors improvised on the topic of the quarrel, and we manually annotated the videos. The evaluation with 67 human participants indicates that the model produces outcomes comprehensible and believable even for persons with limited previous experience with 3D graphics. 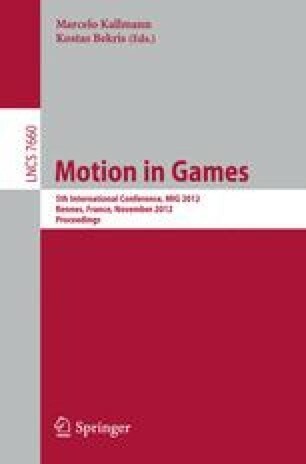 On a more general level, this paper suggests that augmenting steering behaviours by a non-trivial higher-level controller is a feasible approach to modelling behaviour of 3D agents interacting in small groups in a complex way and presents a possible workflow for developing scenes featuring such agents.